HVSB04	| Write the first review! When you’re not allowed to use a wetsuit, the Orca RS1 swimskin blue women is the perfect choice for extra buoyancy, support and better hydrodynamics. 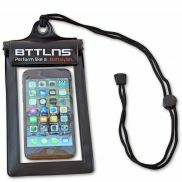 Its completely waterproof fabric prevents water absorption while minimising friction when moving through the water. Its super compressive properties help keep your core stable longer. This suit has been designed for an extremely close fit, which in spite of making it a little more tedious to put on, will benefit you while swimming, without affecting the transition. The RS1 Swimskin also comes in a version with sleeves, so you can choose the combination you like best. A fully bonded suit with a swimmer’s specific cut that will give you the greatest advantage in the water. 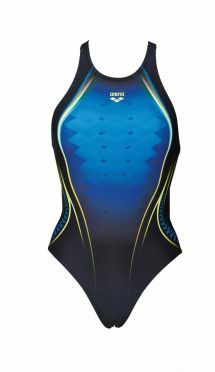 There is a unique combination of Hydroskin fabric and fully bonded seams to make it the most flexible and comfortable skin in the water. Our most advanced HydroSkn Dry water-repellent coating has a zero rate of water absorbency over 3 hours and so increases swim speed and retains natural buoyancy due to the prevention of water entering the fabric. Fully bonded seams make this Swimskn the most flexible and comfortable around, allowing for even greater freedom of movement in your swim. 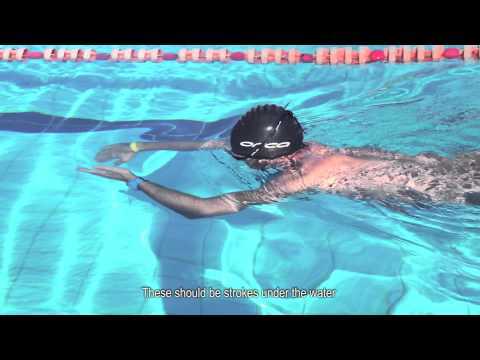 Cut with swimmer’s specific needs in mind the Swimskn moves with you allowing supreme freedom of movement. - High levels of compression reduce muscle vibration to enhance hydrodynamics. 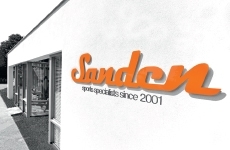 Due to it’s superior elasticity and recovery the garment will maintain the same level of compression after many races. The super- hydrophobic surface reduces friction between the fabric and the water increasing speed, and minimum water absorption means the garment remains light. - UPF50+ protection means that the fabric is the highest protection a fabric is capable of offering and is rated as Excellent UV Protection. This means that the fabric is reducing your skin’s UV radiation exposure while you’re out there on the course. So you can stay out there for longer without having to worry about sunburn on your skin covered by the garment. This Funkita Hot rod single strap bathing suit women with strappy V shaped back has excellent durability and freedom of movement with single bind finish and an open back that will flatter your sporty shape. With full front lining, this is the perfect style for those long hours of training in the pool. Hot rod: After spending time with our good friend Gwyneth it’s clear that inserting coloured bars into our products provides long lasting protection from the subterranean radio waves that are transmitted by an array of bugs and creepy crawlies. Without these harmful waves entering our bodies we’re able to enjoy a peaceful and balanced life because we have your hard earned money now. 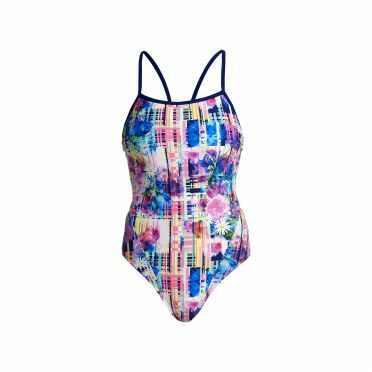 This Funkita Alba wild single strap bathing suit women with strappy V shaped back has excellent durability and freedom of movement with single bind finish and an open back that will flatter your sporty shape. 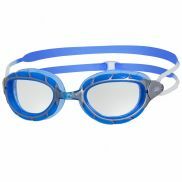 With full front lining, this is the perfect style for those long hours of training in the pool. Alba wild: To experience a sea change from the hustle and bustle of city living, and possibly due to several leaks about certain Cayman Island accounts that we may or may not control, we have made the exciting decision to re-locate the business to the wild shores of the Scottish coastline where the fresh air fills our lungs and the tax office officials will struggle to locate us. This Funkita Needle work single strap bathing suit women with strappy V shaped back has excellent durability and freedom of movement with single bind finish and an open back that will flatter your sporty shape. With full front lining, this is the perfect style for those long hours of training in the pool. Needle work: In order to get the print in the correct place our fit models agreed to wear each garment while the sewer ran the needle through the fabric. The long hours were made bearable by the occasional needle prick to keep the models awake throughout the production process. 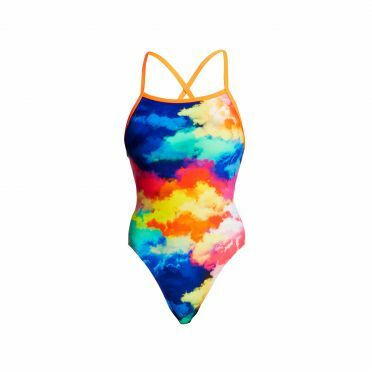 This Funkita Cumulus tie me tight bathing suit women is the one piece style that criss crosses down your back offering you the flexibility to tie it just the way you like. With a moderately high cut leg it’s the perfect style to strap in for a hard session in the pool or relax when you’re poolside. 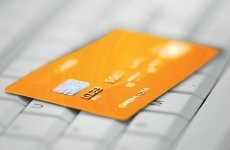 Cumulus: To be a successful company it’s obvious that you have to launch a space program. So we are joining the race to be the first company to fly passengers, in their swimwear, into space. We have successfully achieved our first challenging milestone to design the swimwear that they will wear, and are now onto the easy bit of building the rocket. The Arena One Placed Print swimsuit blue women has cutting-edge construction that will improve your comfort and glide in the water. Made from a single-piece of fabric, this design has no side seams. That means less water absorption, better stretch and an enhanced second-skin feel. Patterned across the front with a geometric motif, we like how the directional detailing streamlines the figure. Recommended for both training and fitness swimming. Please note! This Arena article uses the international size chart, for example an international size 38 is a German / Dutch size 36.